We warmly invite you to join us for the celebration of Easter, when we remember our Lord Jesus's crucifixion and resurrection. You would be most welcome at any of our services or events. 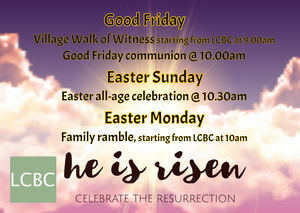 Welcome to Long Crendon Baptist Church (LCBC). Our church is made up of people of all ages, from a wide variety of backgrounds. We are passionate about growing in our relationship with Jesus Christ, sharing his love with the community around us and helping others come to know him for themselves. We seek to play a part in God's mission both in this country and overseas and see this as a responsibility and joy. As a church we come together each Sunday morning and evening to celebrate his love, learn together from the Bible, depend on God in prayer and encourage each other to serve him with our whole lives, as his Spirit enables us. Whether you are already a committed follower of Jesus, interested in exploring what it means to know him, or still sceptical, we look forward to welcoming you. You can find out more about the life of LCBC by following the links above. Don't forget to visit our Future Events page to find out about special events taking place soon.